Last year Gina Lopes McKenna shared these photos of the "new" nativity set at St. Anthony's Church on School St in the Village. The wonderful part of this is that this set once was at The Taunton State Hospital. 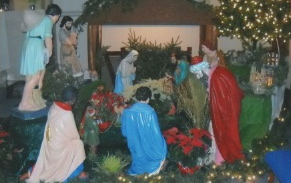 When the hospital more or less closed, a parishioner bought the set, restored it and then donated it to St. Anthony's. Perhaps the prayers of all those patients once surrounding it so long ago blessed it in their own way . How beautiful that it still exists offering its simple message for hope. As we wrote last Christmas, for Portuguese homes when we were growing up, the creation of a beautiful nativity scene was a prayerful task for all of us. My Aunt Eleanor took us kids off to the woods to pick moss and branches to nest the Infant Child. My mother did the same. In essence their nativity scenes needed watering now and then. They went into creating hills and ponds with mirrors.When we saw sweet little animal porcelain figures of animals we often gifted them to my Mom. Her nativity creations had the Noah touch. Our cat loved it, too, somewhere is a photo of her all cuddled up within it fast asleep. Even creatures can adore the Little King. When a child once looked at my own nativity scene and asked me who that was, I was astounded. You never needed to ask a child from the Village. The story was there before our wondering eyes, much more the focus than the Christmas tree. Shepherds wandered to the manger before us which often had a thatched roof, tinsel provided sparkle to our imaginations. 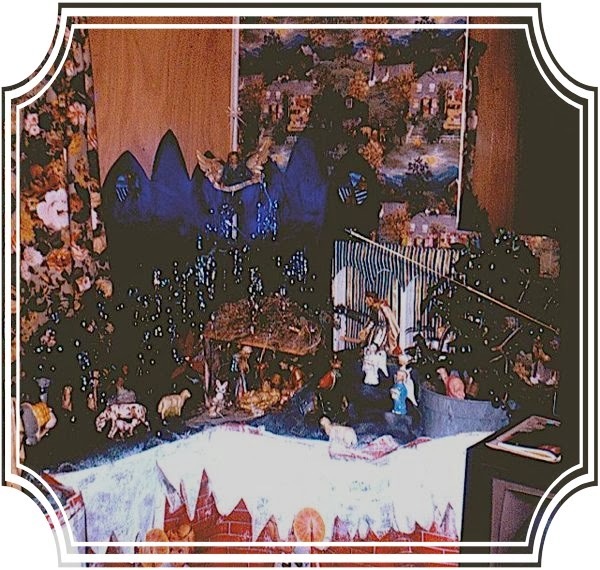 This is a very old slide of one of my mother's nativity scenes. You can see the thatched roof on the shelter of the Holy Family. More figures were below on other "hills" making their way to adore the Child Jesus. We no longer have a Christmas tree, but there will always be my own Nativity set on my mantle as you can see below. There are still some reminders of yesteryear. The little wooden dog at left with stars twining his tail, was carved by my mother. The curly white porcelain lamb is from an old Portuguese set. My white Madonna, St, Joseph and the Child Jesus are Chechoslovakian. 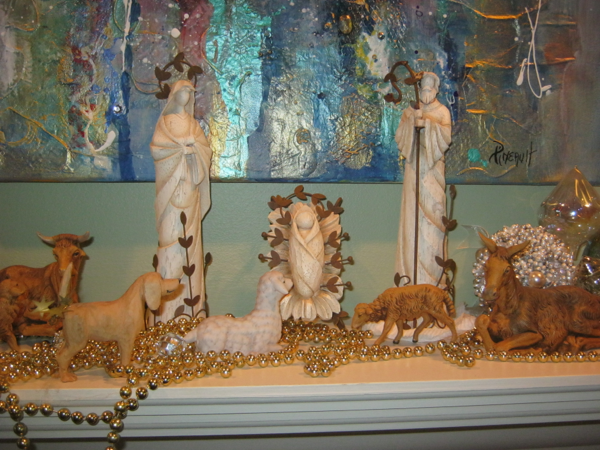 The polymer brown pieces:sheep, donkey and oxen I once purchased from the gift shoppe at La Salette when I had my own first home. Each piece has a memory locked inside. One of my paintings provides background for a night sky. Each year when I take the pieces out and place them I find myself full of emotion and memories. A ceremony as it were, a ritual, a prayer….just as my mother's was……. May each and all find this Christmas full of blessings. 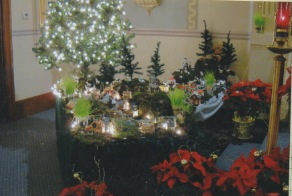 A reader wrote it to share that she would go with her grandmother down to the end of School and Thrasher at the edge of the Village to pick mosses and branches for the Nativity scene they were creating. Another woman would come as well and balance the basket on her head to bring it home.